I know this isnt my usual content but I am finding this is helping just to write it out here. Firstly thanks to all of you who posted a hug, it really means a lot and is really appreciated. John is still in the hospital, they have done lots of tests but so far havent given any answers, something isnt quite right as they wont let him home. We are hoping he will have a scan tomorrow but thats not a definate yet....not what he wanted to hear, John hates being stuck anywhere even if its for his own good. They were doing his checks just before I left tonight and I could see his blood oxygen level is low, ot flashed up on the monitor, I dont know what that could point to but I know it ties in with the things he has been feeling. Last night I did feel worried but I cant have taken it all in fully though until coming home tonight and I got a bit weepy in the car. The worst bit is having to come home and leave him there, that and sitting waiting in the mornings to be able to go in and see him. I really hope tomorrow will be the day we hear some answers to stuff. Its late and a school night but I dont feel much like sleeping. John came home from work complaining about pain in his chest and left arm, so off to the docs he went, it was very late on for the surgery, about 15mins before closing but an hour went by and I heard nothing, then two...... I knew they must have sent him to the hospital, eventually the phone goes and its an A&E nurse to let me know he is there and I am to phone back in an hour to see if they are keeping him in, so I do, and they are. I am just back having gone to see him, he looks ok, they have him hooked to machines, the doc says there are some abnormalities with his heartbeat and then tells us that he will talk to John in the morning about it, I hate when they say that and then expect you to relax and not worry! They heard a murmour too, aparently thats not that uncommon, John is a very very fit healthy man too which I think worries me more. I hope its nothing and just one of those things, this man is the other half of me! Coming away and leaving him there tonight wasnt nice, he looks relaxed enough but I just want to be there giving him a hug!! He says they called an ambulance for him at the health center and that he asked them to call me, he was pretty upset they hadnt but I am not all that surprised really. These things really make you remember whats important. John is my world, theres a high chance hes completely fine but even the threat that something isnt right really scares you. The down side of country life. I dont often write about personal things here but this issue is annoying me and making me laugh all at the same time. Its like a comedy of errors I swear it is! So grab a cuppa and "are you sitting comfortably....then I shall begin"
Last Thursday we had a knock at the door, it was a member of staff from the estate who are our landlords, we were told that they would be fixing the road tomorrow so could we please refrain from using the road???? Errr no I cant actually, its our only road of access and I have three trips to and from the school each day. The person looked a bit taken aback and asked if I could just limit use then. I wasnt totally happy about just how short notice this had been but what could I do....nothing really so I thought I would just have to suffer it. The next day came and went, no work done, and the weekend came and went.....no work done. Then yesterday, completely out of the blue they started and they just happened to start at 2:30pm.....half an hour before I had to pick up kids!! I had no choice but to ask politely if they could let me out and would I be able to get back in, the guys let me out but told me I couldnt get back in! Great...its only my house afterall!!! So I had to dump the car halfway home and walk myself and kids up the now sticky road doing my best to stick to the sides but still we both got our shoes covered in tar. Today its raining so I thought that they wouldnt be doing the road HA! They appeared just as I left to pick up the little ones from nursery. Now here is the part that started me laughing, I am still not sure if its because I found it funny or if it was my marbles leaving the building. When we tried to get back the road was blocked....this time its a phone company and GUESS what they are doing. YUP they are DIGGING the road up...right where the road lot just fixed it! Here it is, my first official finished knitted GARMENT, I am thrilled to bits with this top and so pleased that its something I will get a lot of wear and enjoyment from. The pattern is SHETLAND SHORTY from the new summer knitty (click the pattern name to take you there). The pattern is very well written and a joy to work from, the stitch pattern is easy but not boring and there is minimal making up. The shoulders are bound off using three needle bind off, I havent used this technique before but loved the result in looks and feel, then there was the smallest amount of sewing required at the base of the sleeves and some ends to weave in and that was it, ready to wear!! I used wollmeise sock yarn and knit a size medium, I only needed one skien to make this so that made this quite a bargain. I had 20g left over too so no scary "will I finish" moments. Well Kate has tagged me, and I think this is a lovely wee meme so what the heck here goes! 1. What was I doing ten years ago? Ten years ago I was in my last year at Grammar School! I remember that whole year very very fondly. This was the year that I feel everything started to fall into place for me, I was finally confident enough to be who I really was at school and stuff what everybody else thought! I was also having my best running season that year and I actually won Langholm's big Sprint. This was a HUGE achievement, there had never been a female adult winner before and it put the cat among the pidgeons for quite a while, its amazing how many fully grown men felt the need to come up to me and curse me out.....which made it feel even better to have beaten their runners :P This was also the year John and I got to know each other...need I say more, it was an amazing year! anything sweet...and I mean everything, which is not a good thing. I wouldnt live in this country thats for sure! I would be off to warmer shores where I would buy a nice castle for us all to live in and I could sit and knit my heart out. I was fortunate enough to never move as a child, so grew up in the same place in the borders and didnt leave until I was 18. I spent a year in digs in Edinburgh, I enjoyed it but could never live in the city long term. Then I moved in with John just outside Stirling but we moved back to the borders when I was expecting out eldest son, we lived in a pretty nasty four in a block flat for seven years until moving into this lovely cottage we are in now. Its really busy busy here at the moment. Its a disease that seems to have afflicted a lot of friends and family since christmas and not just me. Its not a bad thing to be busy, it is a bad thing to not get any time for yourself however and I am insisting that I MAKE time for things I enjoy. As a mum a lot of my time is spent doing stuff for and with the kiddies, and doing things for and with the big kid of the house who is also very busy too! He is also begining to understand the concept of personal time and now goes most sundays to play snooker with his new friends which brings me such joy. He found it hard moving to a place where he only knew me and really has spent the best part of a decade shying away from making friends here, now however he has and I see it as a huge positive for him. My me time is of course quite often, knitting time. The brain aint up to anything too advanced right now, that will hopefully not be the case in a month or two but for now I need nice simple yet very satisfying knitting. I knit Kate some mitts for her birthday and I am so happy to see she likes them (or I may have had to take them back heheee because I liked them too!!!) They are my own pattern and I am working on a second pair now to iron out the pattern and then I will make it available to buy. You can get a lookie over on Kate's blog, I forgot to take any pictures before I sent them off! Stupid girl!!! 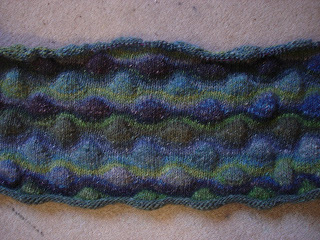 I am knitting Lizard Ridge too, this winter as we all know has been disgustingly cold wet and just plain miserable. This all leads to us NEEDING this to be made.....you listening dearest....I HAD to buy that noro...HAD TO! Actually I got it for a complete bargain price and have been able to get enough to make this at a fraction of the usual price. In fact it was such a bargain I got silk garden instead of kueryon as it was just as cheap. Its coming along nicely, its a great mindless knit, I only have to think once every five rows which is great. But ask me how its going in a few days when its getting heavy to turn on the wrap rows. 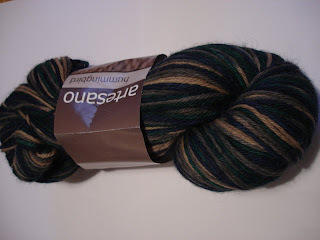 I am destashing a little and have four skiens of artesano alpaca hummingbird up for grabs for you. 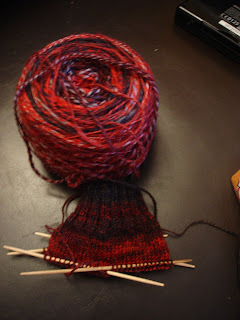 I think two have ball bands and two dont, but none have been knit. I am looking for £60 which will include your postage too in the UK and paypal is preferred thanks :) Oh...the colourway is Mallard.